I started a blog series not too long ago that is all about my guides on how to play the hero's in Paragon. The first installment was a guide on how to play my main, Muriel the ranged support character. As the series continues I have to take time to play the game and do a lot of research regarding each character and their optimized build. This week I was able to get a good start on a Sparrow build that I will share. 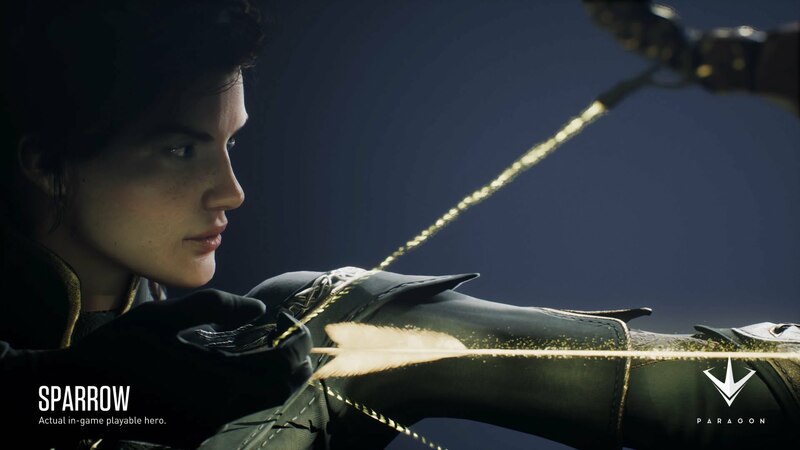 If you're not familiar with what Paragon is, it is a online multiplayer game in which teams of 5 go against each other player vs. player style. In this game each character has 5 abilities that they can use. Each character is unique in their own way, some characters have a lot of mobility or some characters, if built correctly, can 3-shot enemies. The map that is available now is set up into 3 major lanes with one inhibitor, and two towers. In between the main lanes there is a forest of smaller lanes to strategically run through. The goal of this game it to take out enemy’s towers and to eliminate their core. Each tower has a defense system so it is difficult to attack on your own as a player, this is why each team has groups on minions that spawn and run down each lane to fight other minions or to attack a tower. In the forest in between the main lanes there are open areas where the player can fight a set of 3 minions to gain a buff. These buffs can vary depending on what side of the map the minions are on, and can give you either a buff to damage and attack speed or mana regen and cool down rate. So onto this Sparrow build. When the paid Beta first started it was very difficult to find a good build for Sparrow. Most players consider her one of the worst hero's to play or be in a party with. In reality, Sparrow is one of the most powerful hero's currently available. Endgame she can 3 shot a fully buffed Rampage or Riktor. What she seriously lacks in mobility she makes up in her massive basic attack ability. What I've realized with Sparrow is that to build her, it's either a hit or miss. I've found someone who posted a build for her that does really well with some moderate to basic cards. I modified it to fit what my deck has and it seems to work pretty well. 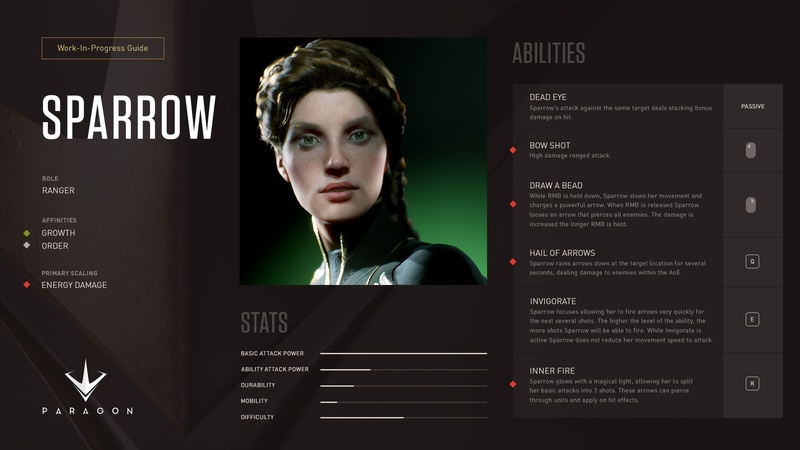 To give you a rundown of Sparrow herself, she is a ranged DPS hero that's basic attack can be through the roof. EPIC games balanced her by making sure that she has no mobility. Most of the hero's in Paragon have a getaway move, but there are few who have nothing. Sparrow can only rely on her damage in sticky situations. With this build fighting a Rampage head on isn't much of a challenge. In the past I played a game with a Sparrow on the enemy side. We were about to win and then, all in 2 or 3 minutes, their Sparrow comes out of nowhere and 3 shots everyone on my team. It only took her a couple shots to bring down our towers and inhibitors until she was at our core. When we respawned she took care of us once again and finished off our core in no time. Sparrow has gotten very few adjustments throughout the Beta because she is pretty well balanced. When I started playing Sparrow, I have to admit that I was playing her all wrong. I didn't know what to go for. Attack speed? Critical Chance? Critical Bonus? Physical Damage? It wasn't until I read a couple forums and tested it that the Critical Chance and the Critical bonus are key to being a great Sparrow. I also have to admit that despite what the Paragon site says, you should probably play her after you've gotten a good amount of cards. If you have the wrong deck or are missing that one card you may need, you'll find yourself dying all of the time and getting no assists or kills. Sparrow is easy to play, it's true, but to build her correctly is difficult. There are 2 big ways to build Sparrow, one is the best but requires very specific cards, and the second is a little easier to build but makes you even more squishy. I'll go over both in this blog to ensure that you can play her based on what you have. I also recommend that if you don't have one of these card substitute it with a card that you do have that is the most like the one you need. There are also a couple things you should know if you are planning on trying Sparrow. NEVER GO ALONE. She is way too squishy to try to take on any lane by herself. Towards endgame she can definitely take out opponents and do some great damage but she is built to have a partner go with her. You'll find early in the game you will get ganged on very easily if you are taking a tower alone and pushing alone. The first way to build Sparrow is to build her based off Lifesteal, Damage, and Attack Speed. this deck is not easy to build if you don't have the right cards. Spiked Boneplate (7.6 Phys. Dmg, 22 Phys. Armor) is a good way to start out the match. This way you have some damage and you also have some defense building up. After getting enough points come back to base and get 3, 3-point Major Strike cards (22.7 Phys. Dmg each). From here you want a bit more damage to deal so a good card is Adamant Edge (7.6 Phys. Dmg, 100 Health). Boost this card with 3, 2 point Stike cards (15.2 Phys. Dmg each). At this point your damage should be good enough to fight minions and defend yourself when you need it. The reason you want this high damage at first is to improve how fast and how many minions you kill. You want to focus on your Hail of Arrows move as much as possible because it can help you control your enemy’s movements a bit more by closing off paths for them. From here you now want to focus a bit on your Critical Chance. Apply the Spear of the Rift Hunter (7.6 Phys. Dmg, 3% Crit Chance) with 3 Major Wound cards (9% Crit Chance). After that you’ll want Blade of Agora (7.6 Phys. Dmg, On Max 50% Crit Chance) apply your best Strike or Wound cards to this. This is where the specific cards come to play. You’ll want Sword of the Alter ( 4 Lifesteal) and apply all Greater Drains (12 Lifesteal) to it. Stonetooth Heart (100 Health, 16 Phys. Pen) is the last card you’ll get and you want 1, 1-point Minor Pierce (16 Phys. Pen), and 2, 1-point Lesser Health (100 Health each). The above build I honestly don’t have the cards to do or even try. So I can’t say that this one will be much goo. I have seen in my research that these cards put together work really well on a dmg, and health based Sparrow. The next build that I’ve tried to build is one that is based on Critical Chance and Critical Hit. For the first card that you should apply it should be Spiked Boneplate (22 Phys. Armor, 7.6 Phys. Dmg) If you don’t have this card then use Blade of Agora (7.6 Phys. Dmg, on max 50% Crit Bonus). You’ll be upgrading this card with all Major Strikes to build up a good amount of damage. The next card you get is going to be Adamant Edge (100 Health, 7.6 Phys. Dmg). Apply 3, 2-point Strike cards to get some more damage before moving on. Your next card is going to be Spear of the Rift Hunter (7.6 Phys. Dmg, 3% Crit Chance) with 3 Major Wounds (9% Crit Chance) Depending on how you are doing you can do another Spear of the Rift Hunter, Adamant Edge or throw in a Windcarver Blade (7.6 Phys. Dmg, 6.5 Atk Spd) And apply 3, 2-point Kinetic (13 Atk Spd) cards. Once again you have a choise I would suggest either Amulet of the Veteran or any of the above. Focus on building a bit more damage. Lastly use Feral Stone, with 3, cards that are kinetic. When maxed this card gives you a 50% bonus Crit. You should be doing a lot of damage and even at times 3 shooting you enemies. That’s all for this build! I’m not sure what hero I will be doing next. After the huge patch that is coming out a lot needs to be reworked and tested.